One-step plating, numbered edition, limited to 2,000 copies! Newly recut from original 30 ips Direct to 2-Track all-analogue stereo master by Bernie Grundman! Groove Note presents the second Jacintha album (following the first audiophile classic Here's To Ben) in the high- quality analog one-step format. 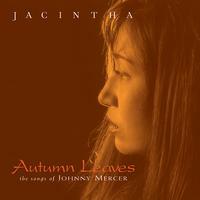 Autumn Leaves features an all-Johnny Mercer program and was, like Here's To Ben, also recorded on Direct to 2-Track analog by Michael C Ross at Oceanway Recordings in Hollywood. It features the same incredible line-up as on Here's To Ben: Kei Akagi, Teddy Edwards, Darek Oles, Larance Marable and also adds Anthony Wilson on guitar. The song list included memorable demo quality tracks such as "Skylark," "Autumn Leaves," "Moonriver" (with a brilliant piano solo by Kei Akagi), and two beautiful mixes of "Here's To Life" (bonus tracks from the movie Play It To The Bone).